A trio of women—including Liberian President and last year’s Commencement speaker Ellen Johnson Sirleaf—have been selected by the Nobel Committee as this year’s Peace Prize winners in recognition of their efforts to promote peace in their respective countries. 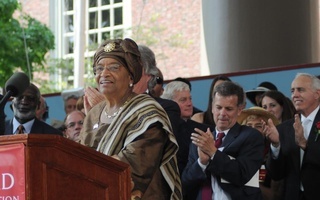 In addition to Johnson Sirleaf, who graduated from the Harvard Kennedy School in 1971, the committee awarded the prize to the Liberian activist Leymah Gbowee and the Yemeni pro-democracy activist Tawakkol Karman, who is a leader in the months-old pro-democracy movement in Yemen. This year’s prize is the first awarded to a woman since the Kenyan activist Wangari Maathai won in 2004, and in its official citation the Oslo-based Peace Prize Committee said that the award should be seen as a recognition of women’s contributions to peace and democracy. “We cannot achieve democracy and lasting peace in the world unless women obtain the same opportunities as men to influence developments at all levels of society,” said Thorbjorn Jagland, a former prime minister of Norway and head of the Peace Prize committee. Johnson Sirleaf is widely credited with restoring stability to Liberia, though the country remains plagued by poverty and unemployment. She is the first woman to be elected president of an African country and is currently in the midst of a tough reelection campaign. “I’m thrilled and I think that it’s a terrific award, and it’s a wonderful message and symbol about the remarkable role that women are playing in the democratizing of the world,” said Kennedy School Dean David T. Ellwood ’75. In Liberia, Johnson Sirleaf has become known as the “Iron Lady” for her strong stance against corruption and her efforts in support of human rights reforms. “She has the technical skill to rebuild the country’s economy, to lead it in its efforts to create a high functioning infrastructure, and to help the people envision and build a new reality for their country going forward,” said Victoria A. Budson, the executive director of the Women and Public Policy Program at the Kennedy School. In her Commencement address, Johnson Sirleaf highlighted the contribution of women in ending Liberia’s long-running, bloody civil war, saying that Liberian women had “fought the final battle for peace” by demonstrating in opposition to the war. In the same speech, Johnson Sirleaf gently chastised the United States for having failed to elect a woman to its highest office. 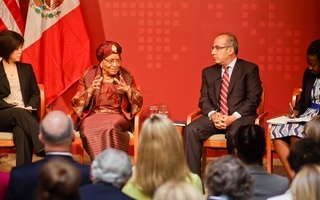 “Let me remind you, America, that Liberia has you beat on one score: We elected our first female president, perhaps 11 years before the United States might do so,” Johnson Sirleaf, who became president in 2006, said to laughter from the audience. Gbowee has worked alongside Johnson Sirleaf in Liberia and was praised by the committee for her unceasing efforts to unite Liberia’s Christian and Muslim populations. “Leymah Gbowee mobilized and organized women across ethnic and religious dividing lines to bring an end to the long war in Liberia, and to ensure women’s participation in elections. She has since worked to enhance the influence of women in West Africa during and after war,” the Nobel citation said. Karman, who since February has lived in a tent at an anti-government protest, has become one of the leaders of the protest against the regime of Yemeni President Ali Abdullah Saleh. His regime is one of several to face sustained protests in the region. That movement, known as the Arab Spring, led to widespread speculation before the announcement of the recipients of the Peace Prize that the committee would honor one of the leaders of the revolts that have toppled governments in Tunisia, Egypt, and Libya. Last year, the prize was awarded to Chinese dissident Liu Xiaobo, leading to vehement condemnations by the Chinese government. The previous year, the prize went to President Barack Obama, a decision that caused international controversy. The prize awards its recipients $1.5 million. This year, it will be split equally between the three recipients. Sirleaf Johnson joins a slew of Harvard graduates to be awarded Nobel prizes this year, including three Harvard educated physicists—Saul Perlmutter ’81, Adam G. Riess, and Brian P. Schmidt—and Ralph M. Steinman, who won the prize for medicine. —Staff writer Mark Guzman can be reached at mguzman@college.harvard.edu.